When it comes to beauty trends, nothing is ever really out. That being said, there are looks that naturally come and go — especially when it comes to hair color. 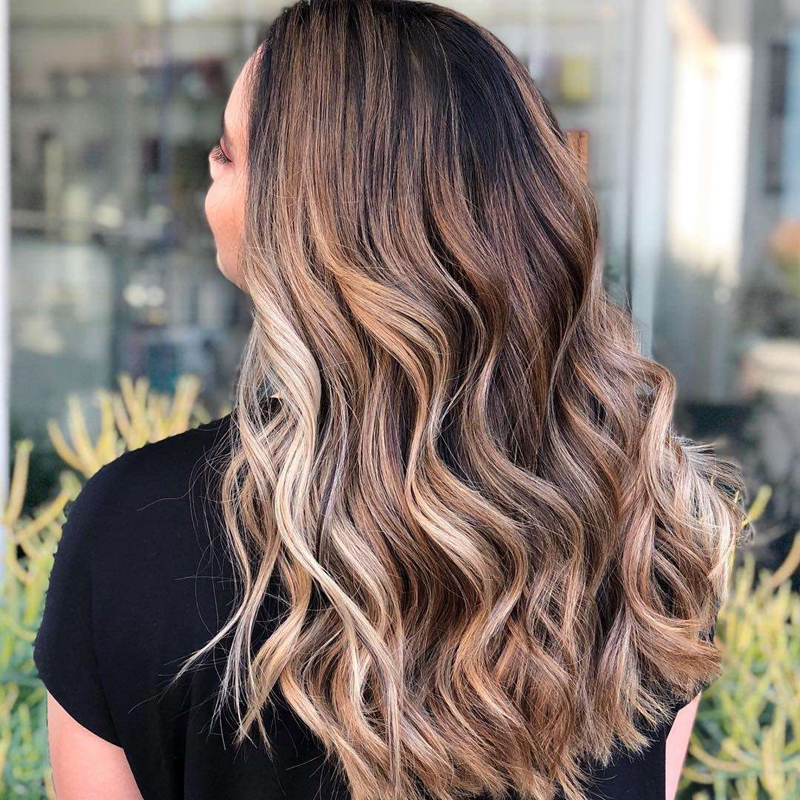 Thanks to social media, it’s easy to see that all of a sudden, your friends, favorite influencers, celebrities, and even regular folks are getting dye jobs in similar, gorgeous shades. That's how trends are born, after all. 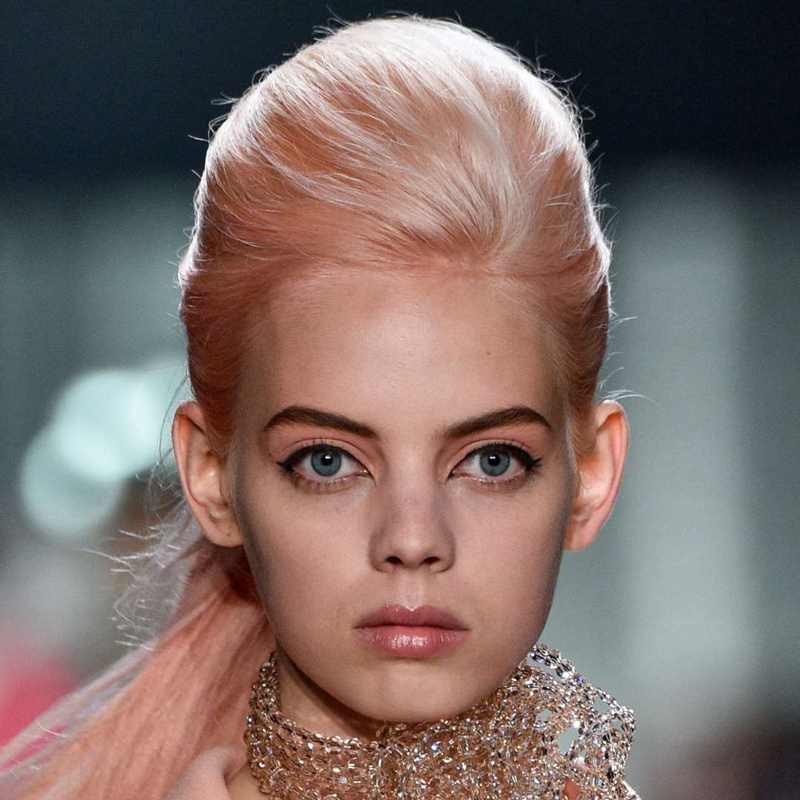 Which got us thinking: How can we get ahead of what's next in hair color? By heading directly to the experts, of course. 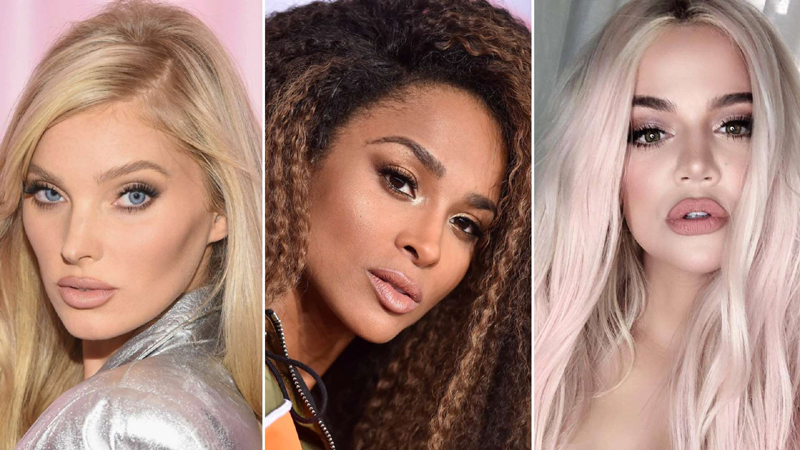 We talked to top colorists who have firsthand knowledge of what hair colors are going to blow up in 2019. They aren't psychic (at least we don't think so), but they're listening to their clients' needs all day at the salon — and some of those clients happen to be major trendsetters. Lucky for us, these seven hues are decidedly wearable. Some are easier than others to achieve (we're looking at you, pastel), but each can look incredible on just about everyone. Your new hair-color vibe for 2019 is right ahead. You'll probably want to bookmark this. It's not surprising model-turned-actress Emily Ratajkowski is rocking one of 2019's hottest brunette shades. In this gorgeous selfie, posted and styled by hairstylist Jennifer Yepez, Ratajkowski's voluminous waves bring out each cool-toned highlight in a subtle, natural way. This brown is anything but mousy. It's ashy and of course, cool — in every sense of the word. 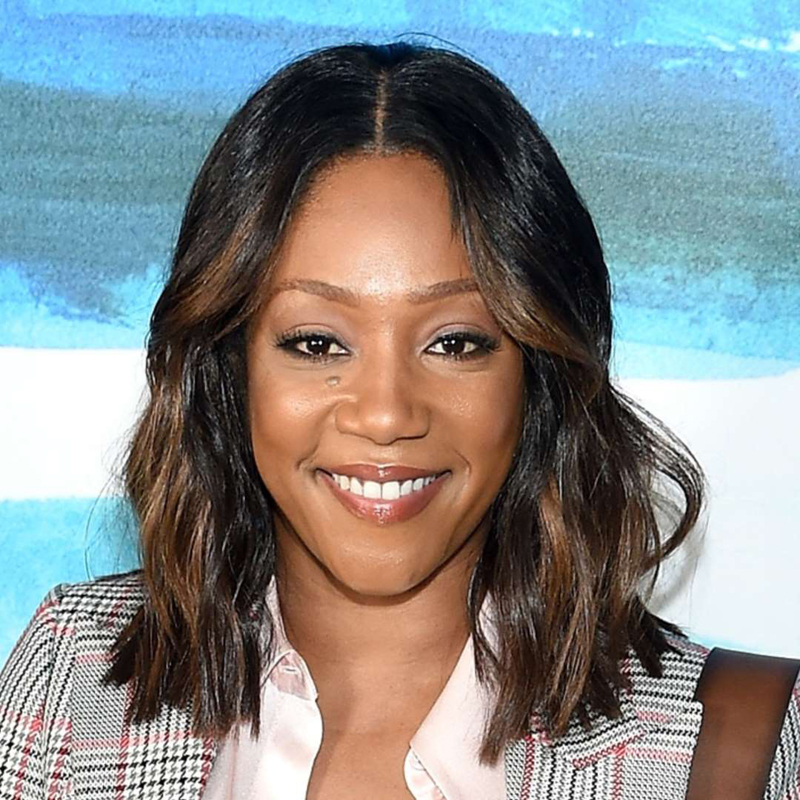 Colorist Rachel Rodt assures us that cool brunette highlights work on everyone with brown hair — not just the stunning Tiffany Haddish. But you have to choose the right cool-toned shade. "With my olive-toned clients, I try to keep the shade on the neutral side," explains Bodt. "On my golden-brunette clients, I keep it more ashy." Model Kaia Gerber's highlights look like she was born with them. 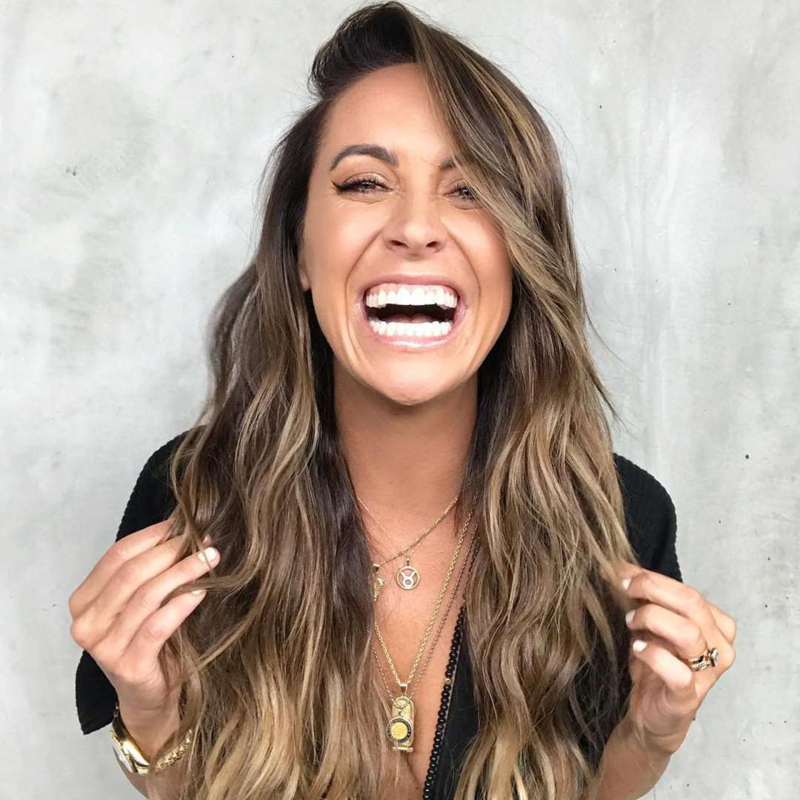 To achieve her look, have your colorist focus baby-fine highlights on the midlength and ends of your hair, as well as the pieces framing your face. 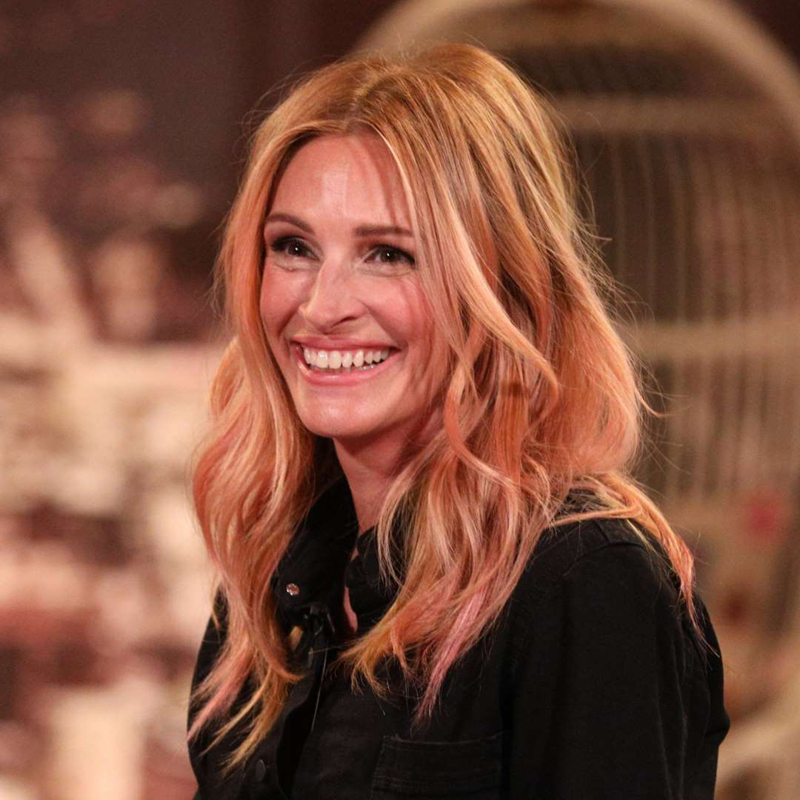 It's not often that Julia Roberts surprises us with a hair transformation. The A-lister has been oscillating between medium-brown and blonde shades, and curly and waxvy textures for quite some time. While promoting her new movie Ben Is Back, Roberts shocked us all by debuting a shade that looks a lot like Pantone's 2019 Color of the Year: Living Coral. The peachy hue brightens up her whole face. For an easy Living Coral hue at home, try a color-depositing conditioner, such as Overtone's Pastel Orange Deep Treatment. On blonde and light-brown hair, it'll turn strands a light peach, like you see here on model Mariana Zaragoza during the Marc Jacobs Spring 2019 runway show. You've heard of dirty blondes, but have you heard of dirty brunettes? "I think we’re going to see a lot of the trend in 2019," says hairstylist Riawna Capri of Los Angeles's Nine Zero One Salon, seen here. She explains that the hue is a natural-looking brunette color that incorporates dark blonde pieces with a more neutral, smoky vibe. It's not warm or cool — it's somewhere in the middle. Capri says that a dirty brunette's highlights don't "compromise a brunette’s brown hair," meaning that they shouldn't lean too far into blonde territory. 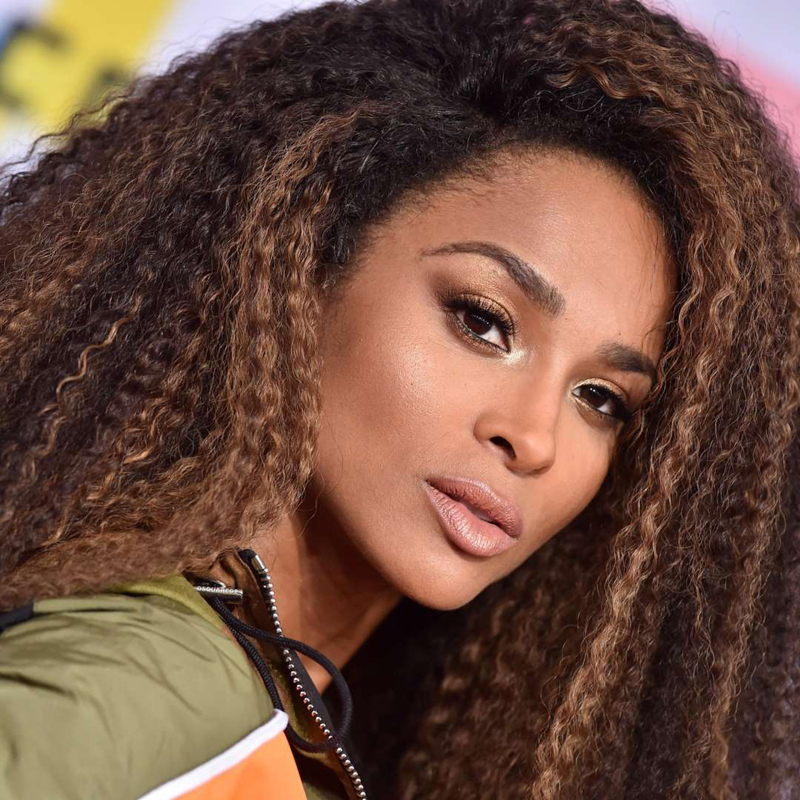 For example, Ciara's hair is still a rich, pretty brown, but it's illuminated with neutral highlights. "Dirty brunette is a nice change for those who are normally cool or super warm," adds Capri. "It’s a perfect balance of both." Actress Jessica Biel keeps her neutral highlights looking natural with laid-back waves. Notice the how the kiss of lighter brown brightens up her complexion. Bodt loves the faded pastel hair trend because it's more of a wash of color, as opposed to a saturated pastel. "It's less of a commitment and looks just like a little blush on the hair," she explains. It's a hint or even a cast. 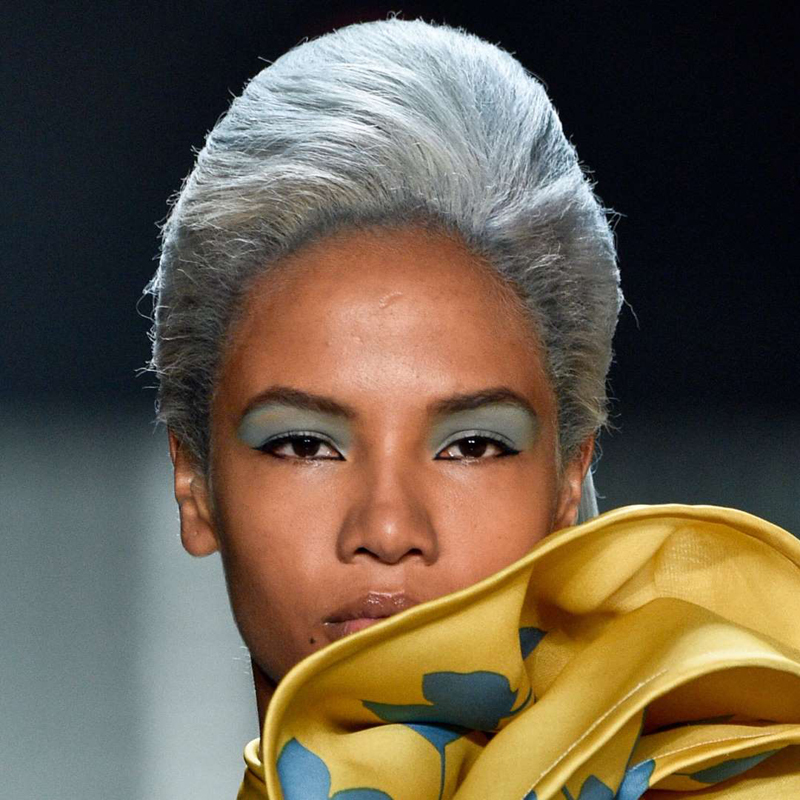 Model Ariela Soares rocked a light-blue hue for the Marc Jacobs Spring 2019 runway show. Hairstylist Andrew Fitzsimons got Khloe Kardashian to this pale-pink hue by using a temporary hair color. "I’ve been playing with spray-on colors lately and have been so impressed with how much these types of products have improved in recent years," he tells Allure. "Khloe and I were chatting about it and she’s always down to push boundaries, so I used the L’Oréal Paris Colorista 1-Day Spray in Pastel Pink so she could see how it would look. She loved it so much, we did it again [last] week for Good American." There are so many perfect dark blonde shades trending right now, it's hard to pick a favorite. It's low-maintenance, pretty, and a great way to winterize your blonde hue. 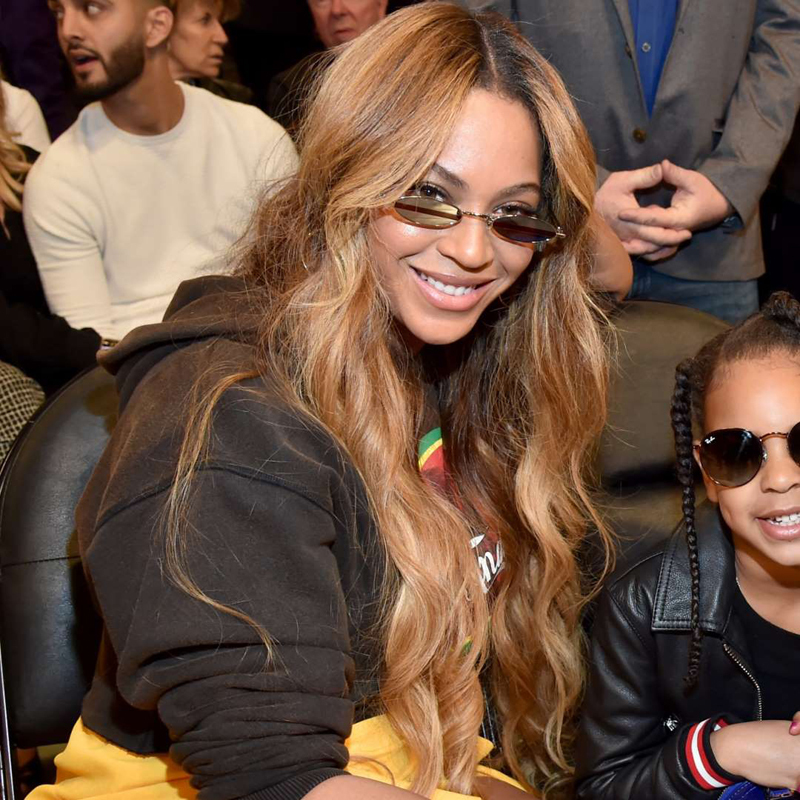 Beyoncé recently tried a version sometimes called "chocolate chip cookie hair." It's a combination of warm brunette hues and strategically-placed light pieces. And it only gets better as it grows out. Massachusetts-based colorist Amy McManus tells Allure, "as a [client's] roots keep coming in, the color gets more beautiful with depth up top and a dramatic dark-to-light feel." Gigi Hadid's hair color has taken on a natural, mushroom hue as of late — and that's a good thing. Maryland-based colorist Yokasta Perez coined the name "mushroom blonde" after mimicking the cool tones of the fungus on a client. It's a surprisingly low-key way for brunettes to go lighter and blondes to go darker and switch it up this year. 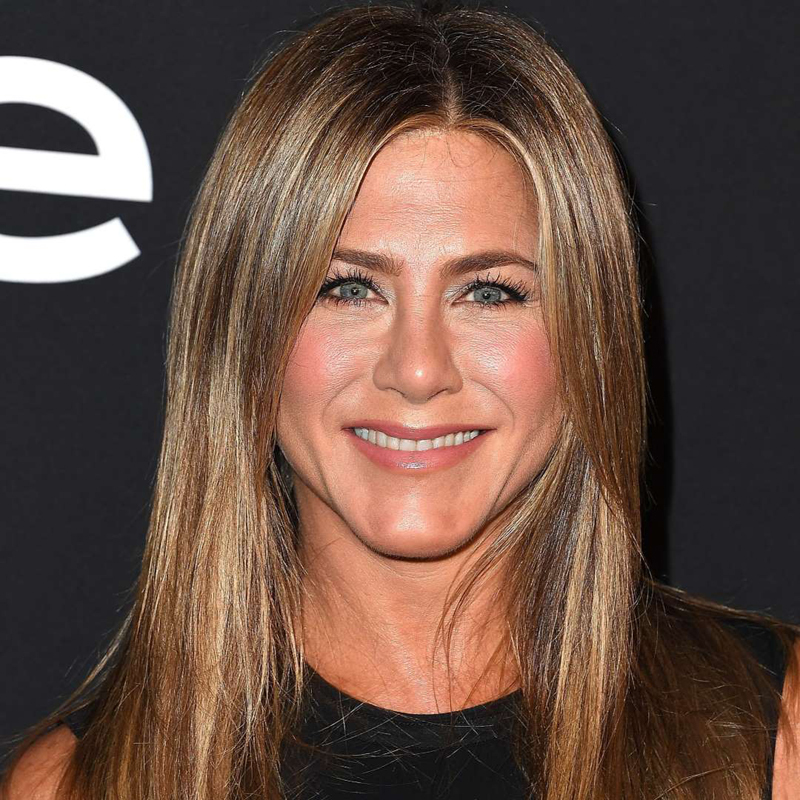 Jennifer Aniston's signature dark blonde hue looks a lot like what Whiteroom salon co-founder and stylist Elisabeth Lovell calls "fall cooldown hair." She originally did the color for a client whose warm blonde hair har turned brassy in the sun. She canceled it out by blending the client's roots with an ashy, light brown and then a "very light pearl" shade around her hairline. It's a no-fail combination that is working splendidly for Aniston, and can work for anyone who is trying to update their blonde color. "[It's] quick and easy, and gives your old highlights a whole new look," she tells Allure. While red hair is always stunning, Bodt says many clients shy away from the hue because they think it comes off too "fiery." Dusty copper hair, on the other hand, still gives you that gorgeous red shade, but a little bit toned down. Bodt describes the color as looking as if it's muted by dry shampoo — in a good way. "I love this color because it’s warm, yet not over the top," she says. 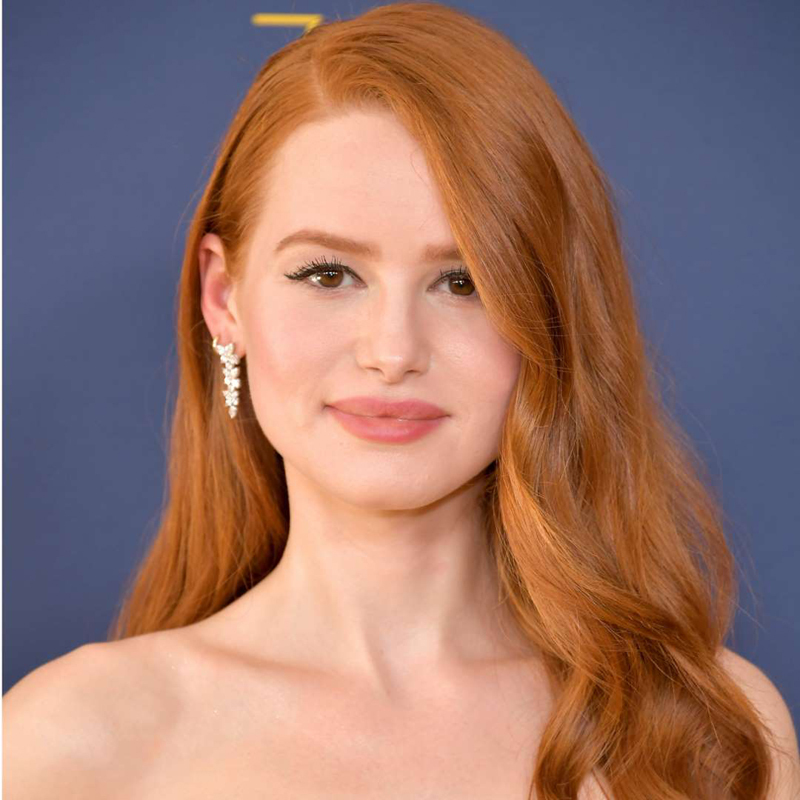 We can't get enough of Riverdale actress Madelaine Petsch's light copper hue, made even more fresh with loose waves. 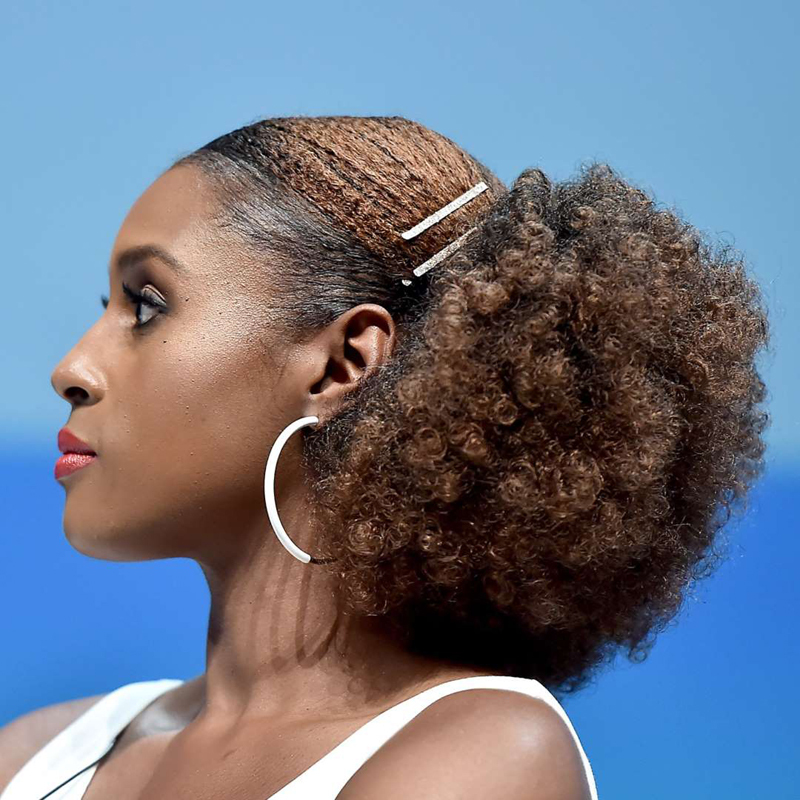 You can add copper to almost any color to achieve this look, such as on actress Issa Rae's curly brown strands. You can see her highlights have just a tinge of the color, like a gorgeously-faded penny. "On my brunette clients, adding a more of an amber tone makes it look sparkly and fresh," explains Bodt. "On my blonde clients, I’ll add more of a golden, warm gloss to their hair, on top of the cool highlights." We're used to seeing Kate Bosworth with bright blonde hair, but this dusty copper hue is a seriously pretty change. Keep a shade like this from fading with a color-depositing shampoo, such as Joico's Color Infuse Red Shampoo. Let white blonde take a back seat in 2019 for this fresher take on platinum hair. Bodt dyed model/actress Andreja Pejic's hair what she calls "antique gold." Pejic rocked the color at the Rome International Film Festival premiere of her movie, The Girl in the Spider's Web. Unsurprisingly, Bodt says this shade makes her think of "old Hollywood glamour." Antique gold hair takes on the color of champagne thanks to a mix of warm and cool hues. It's a little more beige- than ice-blonde, but equally as stunning. Model Elsa Hosk's creamy hair color has a subtle warmth to it that makes faded — or antique — gold a perfect descriptor. To keep this hue from going brassy, make sure you're using a purple shampoo, such as Pravana The Perfect Blonde Shampoo. Michelle Williams's antique gold hair looks shiny and healthy. Keep yours looking the same by adding a little Olaplex to your routine. Often called a magical protein, is a three-part bonding treatment is designed to protect and strengthen bleached hair. Plus, they've added a shampoo and conditioner to the line so you can use it on the regular at home. Combine with a great conditioning mask once a week, and you're on your way to the antique gold hair of your dreams. Blackberry hair is a look folks loved in 2017, and we don't see any reason why the playful dark hue won't be around in 2019. 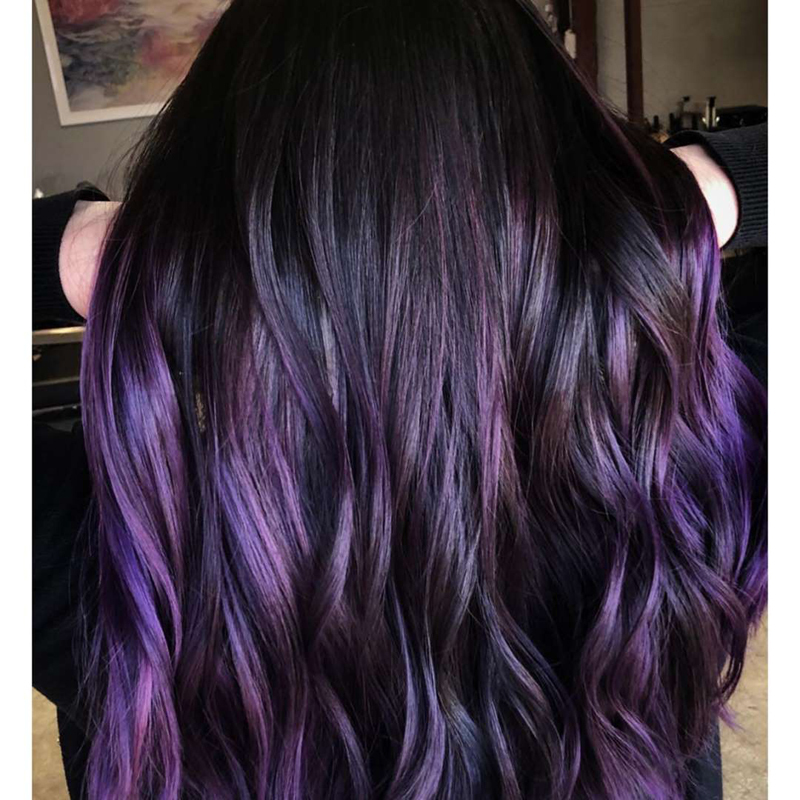 This particular dye job, done by Maryland-based hairstylist Megan Schipani, has the obvious purple tones, but it also includes a little blue to give it some dimension. While this blackberry shade is great if you have dark hair and want a little color, colorist Rachel Bodt notes that you still have to go lighter in order to achieve this hue. "When you are doing the dark purples, even though they are dark tones, [the hair] still needs to be lifted light enough so you can see the purple," she tells Allure. "When you start doing more blue tones, it needs to be even lighter because if you put blue on yellow hair it will [turn] green." But besides that, Bodt believes that this color is great "for someone who has super dark hair and wants to still read brunette." And yes, even a deeper color like this needs some maintenance. To keep the shade on-point, Bodt suggests a cowash like R+Co's Analog Cleansing Foam Conditioner. She also says that using a color-infused conditioner, like Overtone, is a great way to help your color last. 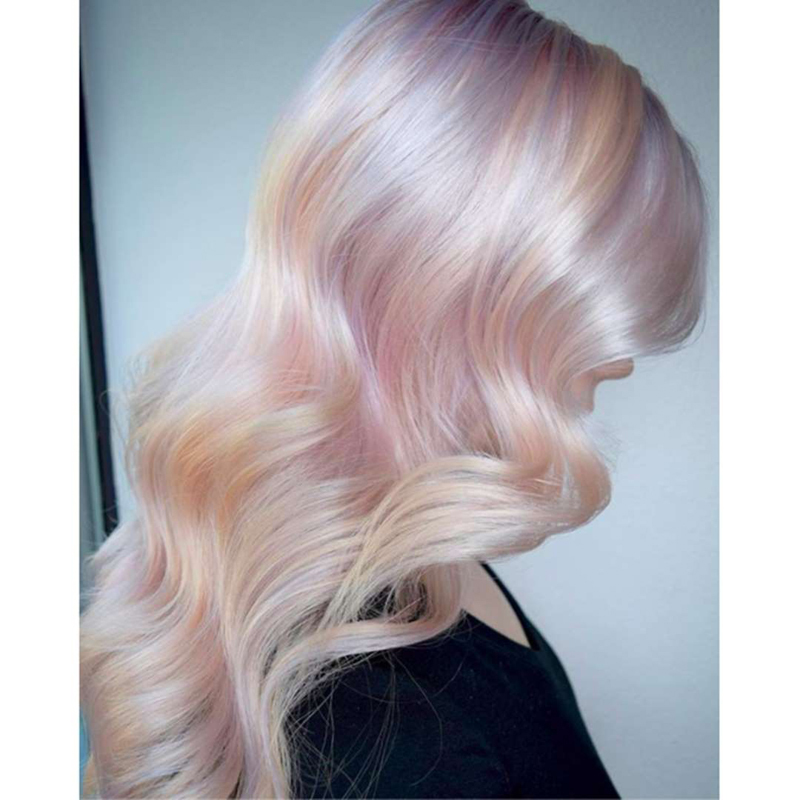 Pastel, opalescent colors like this one are all over our Instagram Discover feeds. It's a nice update to all the unicorn dye jobs we saw in 2017, except color combos like this tend to fade far more gracefully. "The opal color is so beautiful and is great for someone who already has a double process and is looking to switch it up," says Bodt. "I love those dusty tones because I think they are sexier and a cool, sophisticated way to play with color." Of course, with a shade like this, your hair must be lifted to a super light blonde "so those colors are very reflective," Bodt explains. "Especially with [this] opal look, if there is too much yellow left in the hair, it can mess with the tones and not look right." For this look, husband-wife duo Mike and Melody Lowenstein, owners of Ross Michaels Salon, lifted the color to a level 10 before coloring. If you go with a color like this, be sure to have some Olaplex on hand to maintain your hair health. "This is going to be big because 2017 was the year of platinum-ashy blondes," says colorist Cassondra Kaeding. For 2019, give your hair a break and go darker with your blonde hue, like this warm, golden-honey color you see on Rosie Huntington-Whiteley. Don't be afraid of a warm-blonde tone. "People think they can’t pull off warm colors or think they are 'brassy,' but just like any color, there are so many variations," Bodt explains. "Golden beige, honey-golden blonde — it’s all about the right tone for you." If you're looking to go for the change, make sure you're diligent about upkeep. "Maintenance is key when revamping your color. It’s so important to continuously use a color-safe conditioner that moisturizes hair." Kaeding, who is a colorist with Dove Hair, recommends the brand's Color Care Conditioner. The end result looks like the yummy caffeinated beverage with just the right amount of milk. Warbourton shared a tip on her Instagram page on how to execute this look. "Varying your developer and remembering how permanent color works can get you stunning results like this," she captioned the image. “Flirty and fun hues can bring something unexpected to your look,” Corney explains. Take notes from the Purple Unicorn herself, Justine Skye, who has been rocking the hue for a hot minute. "Warm strawberry coppers and blondes will be huge this season," Bodt tells Allure, but make sure you do a test run before taking the plunge. "If you want to try [this trend], start out with a gloss so you can see how it will look on your skin," she suggests. Kaeding is also loving the hue. "I would really like to see more strawberry blondes and honey-rose tones — it’s time to switch things up," she says. We love the mix of rosy and blonde hues in Deborah Ann Woll's hair. This year, it's all about embracing rich, dark hues and complementing them with just a touch of lightness, like you see here on Ashley Graham. "A mélange of dark browns and light browns is great for warming the complexion without the commitment of a full color,” Corney says. And the best thing about it? “You don’t have to retouch it as much as you would a full color." Call it the Donald Trump effect, but colorist Julia Elena says she's been getting a ton of requests from clients to go full-on orange. "When you think about it, orange and yellow aren't exactly what people usually like when it comes to hair color, especially next to their skin. When somebody wants to go blonde, the first thing they say is, 'I want to be blonde, but I don't want brassy hair,' and brassy hair is orange and yellow." But all that's gone to the wind, and people are beginning to embrace the unconventional hue, like model Slick Woods. If you want to try it, be sure to talk to your colorist about what would complement your skin tone. "I had a girl who did an orangey-tangerine color. I had to put in some pinks, some pink-orange, even hints of brown to kind of balance the color overall in order for it to work." But the number-one tip for pulling this color off? Confidence. "Orange is such a loud color, so you can't be afraid of it," says Elena. "You have to go all in."